The ability of this antibody to fix complement is unknown. Our Abpromise guarantee covers the use of ab409 in the following tested applications. Western blot - Anti-N-epsilon acetyl Lysine antibody [11A1] (ab409)Image from Pehar M et al., J Biol Chem. 2012 Jun 29;287(27):22436-40. Epub 2012 May 24.; Fig 2.; doi: 10.1074/jbc.C112.362871; June 29, 2012, The Journal of Biological Chemistry, 287, 22436-22440. 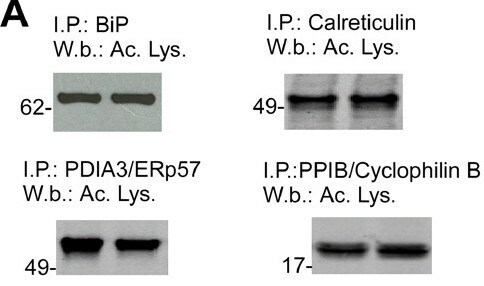 Western Blot analysis showing ab409 staining N-epsilon acetyl Lysine on immunoprecipitated ER-resident proteins from control (non-transfected) H4 cells. Publishing research using ab409? Please let us know so that we can cite the reference in this datasheet. Could you please tell me what CBZ is and is the CBZ acetylated or is it the KLH? Thank you. The carboxybenzyloxy (CBZ) is a blocking group used to protect the primary amine during organic synthesis. We have used this derivative for the immunogen synthesis. There was no acetylated group on the immunogen. Was the antigen that was used? The immunogen used to prepare this mouse monoclonal antibody was the KLH-lysine Nalpha-CBZ If you have any additional questions, please contact us again. Ab409 used to be sold in lyophilized form and is now sold as a liquid. I apologize for the mistake on the datasheet and it has since been updated. Would you like a replacement vial of ab409? Please let me know and I can have it sent to you next week. One of our clients would like to know whether the peptides you tested included sequences from the p53 and/or p65 (from NFkB) proteins. If yes, did Abcam's Ab recognize them? If not, did the other Ab you use recognize them? The suppier of ab409 was able to inform us that Ab409 was not tested on p53 and p65. Hi: I am a graduate student at University of New Mexico. I bought the anti-acetyl Lysine (ab409) and anti-arginine (ab412) antibody for Western blot from you. I am just wondering that what kind of blotting reagent I should use for these two antibody: skim milk or BSA in TBST. Thanks for your help. We would suggest using BSA in TBST solution. Do not hesite to contact us for any further information. I have Anti-acetyl-histone polyclonal from your company. The catalog no is NB 500-108.I wish to use it for western blots of acetylated histones & also to detect any other acetylated protein.My question is 1.Is this the appropriate antibody for this purpose? 2.What is the dilution that I should use? Yes, ab409 -- Mouse monoclonal (11A1) to N-epsilon acetyl lysine is suitable for use in detecting acetylated histones and other acetylated proteins. Suggested dilution for Western blot is 1/500 to 1/5000. Do you know which acetylated histones are recognised by ab409? This antibody should recognise all acetylated histones. Both antibodies have been found to work well in WB. However, neither have been assessd in a supershift experiment, therefore we can't guarantee results. All the information we have for this antibody is on the datasheet and at present, this is the only antibody agaisnt acetyl-lysine that we currently have in our product range. Our policy at Abcam is that if an antibody does not work as specified on the datasheet, we offer a replacement or reimbursement. We do not routinely sell samples. We also offer a USD20 Amazon gift voucher to researchers who feedback information about our products.